Alright ladies and gents, winter is gone which means it's time to take care of all that fuzz you've been hiding under those layers. 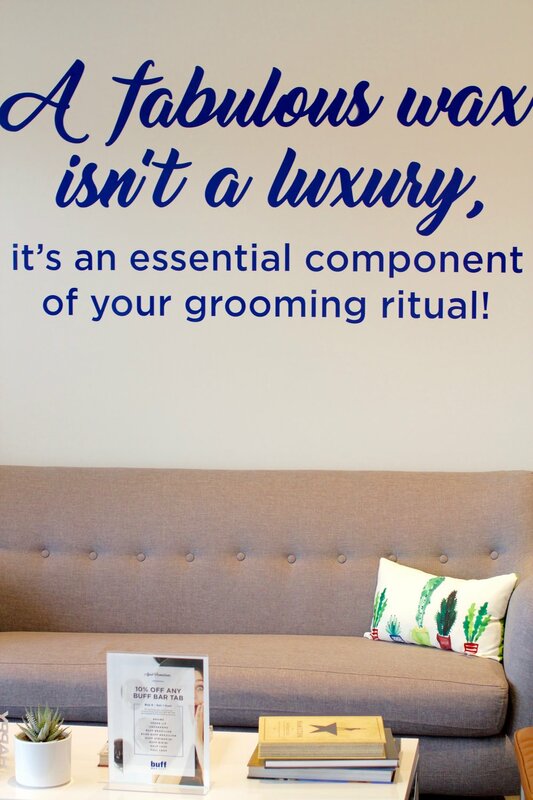 That's why I think it's the perfect time to introduce you to Buff Wax Spot who is CHANGING the waxing game with their all-new and first of its kind wax bar in Alberta! But before we talk about the wonderful procedure of removing your hair, let's talk about the BEAUTIFUL woman who created Buff Wax Spot. Sina moved from Toronto to Edmonton a few years ago and was surprised at the lack of wax spots or "wax bars" and became disappointed in the overall waxing game. Thus, Buff Wax spot was born. This boss babe has amazing vision and such a kind heart. You can tell she loves what she does and she has a wealth of knowledge to share, I learned so much from my short time with her. Sina has executed her business in such a clever and exciting way and I can't wait to see where it goes! Okay, now let's talk about why you need to get your fro into Buff Wax Spot ASAP. First of all, before your appointment you have to fill out a questionnaire that includes questions such as "Do you have any allergies?" because if you were allergic to something they use they would find an alternative that works for you. Another question you'll see is "Have you received any dermabrasion, laser resurfacing, or chemical peels?" because if so, you won't be able to get a wax right away because your skin might rip off, eek!. I thought the questionnaire was such a great idea and it's such a simple thing to do but adds such a huge impact to your waxing experience because of course you want to leave with smooth and beautiful skin and Buff Wax Spot wants to make sure you do as well. "...that's the secret sauce of Buff Wax Spot-we've created a no-judgement, friendly, open space where everyone is welcome to come get waxed." One of the things you'll notice is how clean everything is and how obviously dedicated they are to hygiene. They have even admitted to being obsessed with clean. What that means for you is they don't double-dip (use the same wax spatula over and over), they sterilize between every client, and you just feel a lot better about baring it all and leaving your unwanted hairs there. The fact that Buff Wax Spot ONLY does waxes means that they are going to do it right. They spent 8 months testing waxes and trying to find the right wax that worked best for them and their clients. Side note: I hope this doesn't sound ignorant of me but I learned from Sina that most waxes have a beeswax base, which I had never thought about. It makes so much sense now but that also means they are technically not vegan but the waxes at Buff Wax Spot are!!! And as if you didn't need even more reason to come here, I have to tell you about the actual space. It is bright, airy, clean, and filled with amazing local products. You'll also notice that the walls are covered with the most fabulous and clever sayings like "We've seen more goodies than a candy shop". There's a lot to look at and everything is bold and cohesive (good job graphic designer). Okay so they're clean, they use all the best products, and they know what they're doing. But the best part? They make you feel great! Fantastic, even. Sina made me feel right at home and answered all my questions and gave me some amazing advice on how to help with my waxing-related issues (like ingrown hairs). They have the best after-care advice so don't be afraid to ask. And they make it okay to talk about waxing. They don't make you feel embarrassed or like it's anything out of the ordinary. This might sound crazy but I think Buff Wax Spot will actually start making people enjoy getting waxed. So if you're thinking this place sounds amazing (it is) but they are probably over-priced, you're wrong! And as a bonus Sina was kind enough to offer my lovely readers 10% off your next waxing service if you book between May 1st- May 15th. Head to Buff Wax Spot's website and use the code "10%OFFLIFEWITHZANDRA" and you'll be one step closer to the smoothest and sexiest skin you've ever had! The only thing I have left to say is, Buff Wax Spot can you please come to Calgary? !